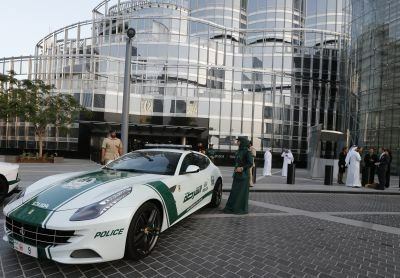 DUBAI Metro - Trying to out-run Dubai police in a car chase just got even harder after they added a Ferrari to their expensive fleet. The force’s latest sports car - believed to cost betwe£228,000 and £415,000 - comes hot on the heels of a Lamborghini Aventador, which was unveiled earlier this month. ‘Dubai is a unique city and everything in it should reflect its uniqueness and for that reason police will add a Ferrari sports car to its patrol fleet,’ said Dubai’s police chief Lieut Genl Dhahi Khalfan Tamim. ‘We have been pleasantly surprised by the reaction of people to the Lamborghini, so we said a Ferrari would be a good choice too,’ he told GulfBusiness.com. The latest addition to the flashy squad was unveiled at the foot of the Burj Khalifa - the world’s tallest building. The Ferrari FV boasts a V12 engine, which can reach top speeds of 208mph, and is capable of going from 0 to 60mph in just 3.7 seconds. 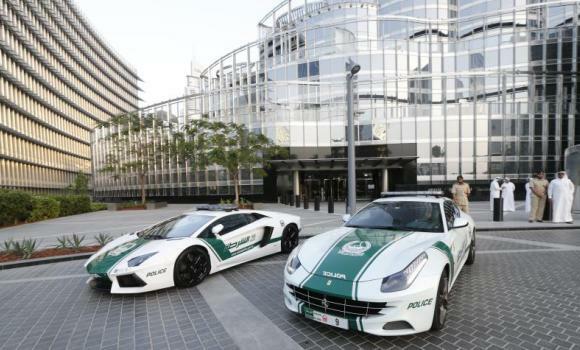 A picture taken on April 25, 2013 shows Lamborghini and Ferrari police vehicles at the foot of Burj Khalifa in the Gulf emirate of Dubai on Thursday. The Italian-made Ferrari has already been emblazoned with the police force’s distinctive green and white colours. 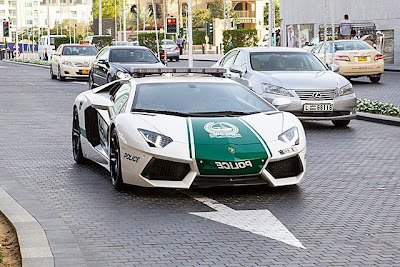 The introduction of luxury Italian cars to the police force is being seen as a sign of economic recovery in the Gulf emirate where a housing bubble burst in 2008. Police hope the sportscars will be a deterrent for owners of high-powered vehicles thinking of breaking the speed limit. 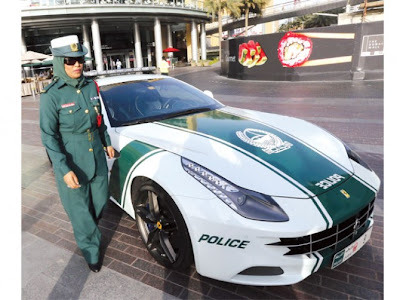 A Dubai woman police officer stands near the Ferrari police vehicle. But the Ferrari may also be used by female police officers to patrol tourist hotspots. Dubai police force’s fleet also includes a Chevrolet Camaro SS, a Dodge Charger and a BMW 5-Series.